We recently moved about a mile and half away from our old house into a new house. We decided to take the time to purge a lot of our toys and books and other items. While our house was on the market to sell, we also put a ton of things in storage and each kid got to keep only a few items to play with. After almost a month and a half, I thought I'd share with you what toys the kids played with for the longest amount of time. 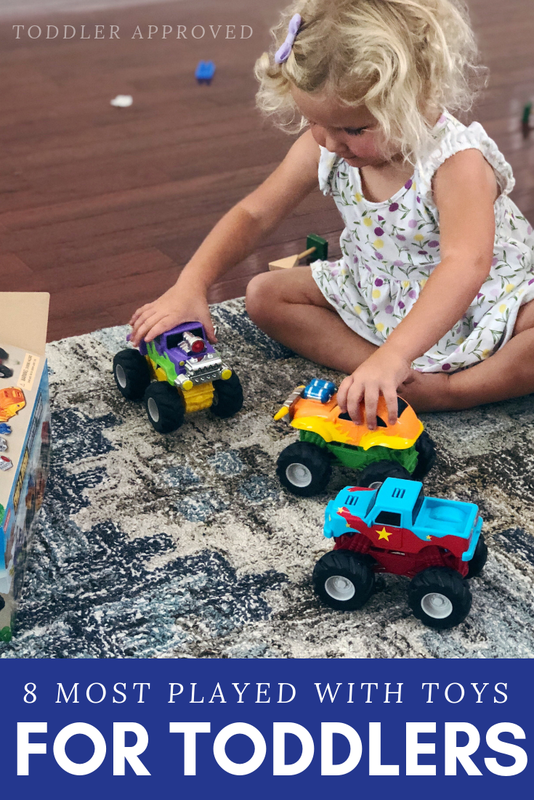 We're sharing our 8 Most Played with Toys for Toddlers and Preschoolers! If you were to just buy these toys for your home, you probably wouldn't need anything else. My kids range from ages 2-10, so not all of these toys worked for everyone all the time, but these toys plus cardboard moving boxes kept everyone happy for most of the time! Now that we are in our new house, these are still the most popular toys to pull out. Although there are so many fun learning toys and gadgets to buy, we've found that sticking to classic open-ended toys is the smartest. At the bottom of this list you can find our gift guides for kids ages 2-4 as well with a few additional ideas. Whether you are a fan of Magformers or Magnatiles or Piaget Tiles, make sure you invest in one of these. They are worth every penny. My kids spent an entire month playing with theirs when most of their other toys were in storage. 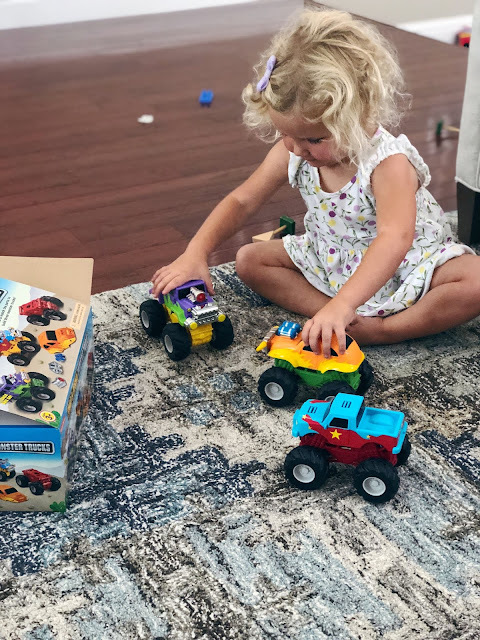 I love that all four of my kids (ages 2-10) have fun with Magformers and they can use them for pretend play and building challenges. We have several plastic bins of both Lego and Duplo bricks. My toddler loves the Duplo series and my 5-year-old has fun with the LEGO City, Juniors, and Creator series. My 7-year-old daughter loves the LEGO Elves and LEGO friends sets, and my 10-year-old is a big fan of the Minecraft and Stars Wars sets that he has. After they put everything together, they eventually get pulled apart. Now we keep all the Legos in plastic bins and the kids use their creativity to make new things using their imaginations. We were introduced to Hatchimals last year when we worked with SpinMaster on an Easter partnership. I had no idea that my kids would become so Hatchimals obsessed. Two of them are dying to have Hatchimals themed birthday parties. They love to crack the eggs, but mostly they like to carry their egg cartons around with the little animals and just play. They bring them on long car rides to play, to church, and all around the house. I love seeing the creativity that is sparked by these cute little animals. All four kids love them. I guess I shouldn't call books a toy, but our book collections have been lifesavers over the past few months. The kids each selected a few favorites to keep in their rooms and then I kept my Fall/Winter holiday books out of storage. Some favorites included The Elephant and Piggy series books by Mo Willems, The Magic School Bus series, and a few Eric Carle picture books. Our baby doll collection has been a big hit with my 2-year-old and 7-year-old. Pretend play is one of the best ways to help kids use their imaginations. I've loved watching the kids play and take care of their babies. One of our favorite dolls is a Corelle baby doll. We have several Little People sets, so we put the big ones into storage and just kept out the Little People figures and the Little People airplane and school bus. The figures were often included in Magformer playtime as well. Kids love to drive the Little People airplane and Little People school bus all around the house. I think you probably only need 3-5 cars/trucks at the most for kids. We have way more than that, but my kids usually only pick a few to carry around with them everywhere. We love the wooden car sets from Melissa & Doug along with Thomas the Train sets. Both are worth every penny considering the hours of time my kids have played with them. My daughter currently spends all of her free time trying to make her Thomas train magnets connect. She even brings them to bed! Other things like our Lakeshore monster trucks and our push and pull soft cars have also been hits. You can't go wrong with any of these! This micro mini scooter is another toy that is played with daily. My toddler loves to zip around on her scooter in our cul de sac or at the park. It is such a great way to get toddlers moving and work on coordination skills and listening skills too (as you chase after them). I also get a good workout! During the winter we meet up with several toddler friends at a local gym and let the kids ride their scooters around. They are like a big toddler scooter gang. It is hysterical to watch. Now that I've shared our top 8 toys, I'd love to hear yours! Are any of these toys on your Top 10 list? What is one toy that your toddler or preschooler could play with every day for a month? Here are some of our other favorite TOY ideas for toddlers if you need more ideas!